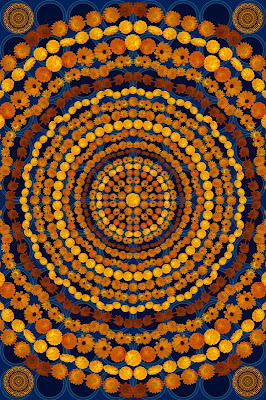 I have redone the calendula mandala. I offer it on two backgrounds. The first is over a celtic knot design, the second is over a blue circle pattern. Because the blossoms are small, but don't grow in clusters like the bouganvillia, I had to create my own curved combos to create the wave effects. 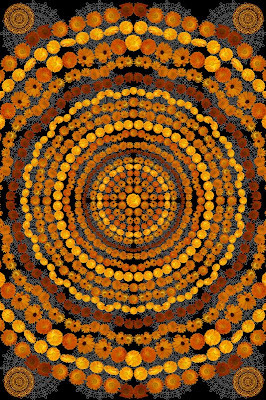 The other new feature on this mandala is that while I expanded the central mandala off the page, when I created the reduced mandalas for the corners; I a included the whole mandala. I am impressed by the capability of the software.